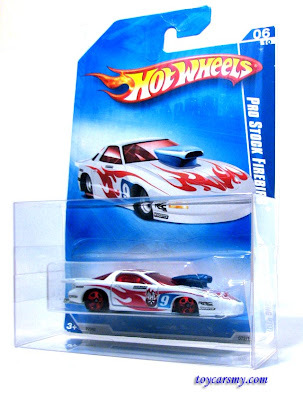 Many fussy Hot Wheels collectors imported the Hot Wheels Kar Keepers from overseas to protect their cards from damaged. It is very pricey to time consuming to have it shipped from foreign countries. Lucky we have a collector understand our need and produced a local made protector at affordable price, Foldabox, by Rodapanas. 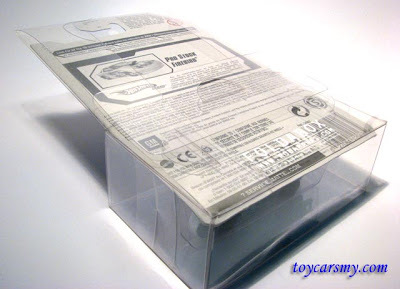 The protected wrapped the card all rounded keep away the worry from being damaged. 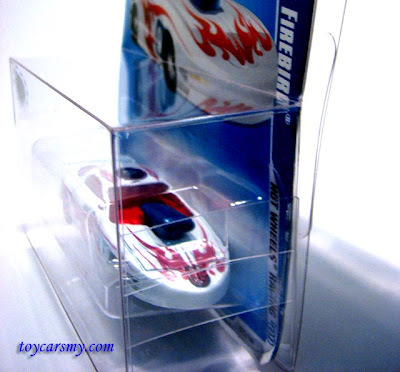 Besides, the allows the card to be displayed upright without any additional support. If you have few more to showcase together, the protector capable to stack vertically and horizontally with some tricks apply on the leafs. It is a good method to showcase your teams series, the protector absolutely not problem to arrange for 2 x 2 for 2008 to 2 x 5 for 2009 series of 10 models. At present, I have not seen any retail shop selling this brilliant product. I'm luck to got it from the producer himself. Every Foldabox is selling in pack of 3 for RM10.00, more information is available at the official site if you interested to know more. Or you can join HWCM weekly to see and feel the actual item. Verdict: Like I said, it is a good product should have it long time ago before we have to buy it from Ebay. I Like: The stacking feature, it holds firmly became a giant showcase. I Dislike: Should I say areas for improvement. Air seal, moisture will cause card to fade easier. Perhaps the later product will include this feature.